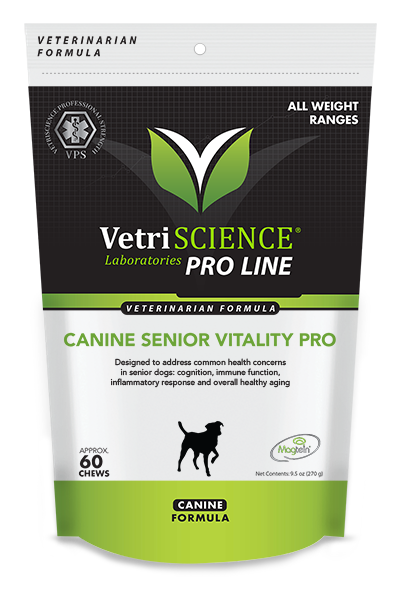 Designed to address common health concerns in senior dogs: cognition, immune function, inflammatory response and overall healthy aging. 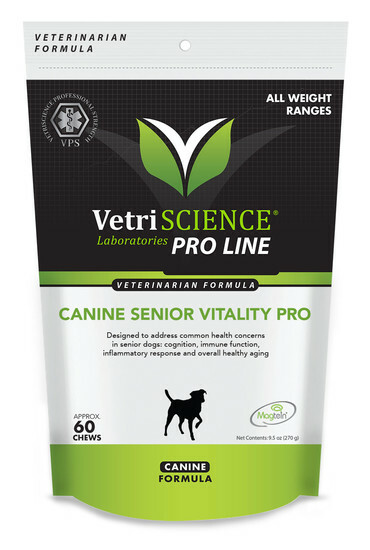 Designed to address common health concerns in senior dogs: cognition, immune function, inflammatory response and overall healthy aging Canine Senior Vitality Pro is a single chew that addresses multiple health concerns such as cognitive dysfunction, inflammation, immune and metabolic functions. It is powered by extensively researched ingredients to deliver maximum health benefits. This groundbreaking canine supplement is formulated with Magtein®, which is clinically shown to support cognition and brain health in senior dogs.. CAUTION:Administer during or after the animal has eaten to reduce incidence of gastrointestinal upset. CAUTION:An examination from a veterinarian is recommended prior to using this product.